Although classification schemes vary between scientist studying different organisms, the general idea behind a genus is that it represents species that are ancestrally related, are distinct from other genera, and do not include an unnecessary amount of species. The determination of this is up to each investigator, but these general guidelines keep classifications fairly narrow when it comes to genus. The taxon above genus, Family, often includes body forms that are recognizable between groups. For instance Felidae and Canidae represent the cat-like creatures and dog-like creatures, respectively. In each family lies many genera of each type. Wolves, for instance are in the genus Canis, while foxes are in the genus Vulpes. The last step, Species, defines populations and groups that reproduce together in a continuous unit. Most of the time, different genera will not reproduce due to genetic, behavioral, or morphological differences. Carl Linnaeus, the famous zoologist who devised a naming scheme for biological organisms (binomial nomenclature), popularized the term “genus”. Although his definition of a genus varied from our modern view, the use of generic epithets in binomial nomenclature continues. The generic epithet is the first word of two in the name of an animal in binomial nomenclature. This generic epithet describes the genus that the organisms belongs to. The second word or specific epithet, describes a more closely related group of organisms, or species, which the organism belongs to. Together, these names tell you a great deal about the organisms. By knowing the genus, one also knows the family, order, and every other taxonomic classification. Because the hierarchical groups are arranged by similarities between organisms, these relationships tell us much about an individual animal. Knowing the species can inform us on how the animal is unique from others in the genus. For example, the honey badger has the scientific name: Mellivora capensis. Knowing that the honey badger is in the genus Mellivora tells us that the animal is in the family Mustelidae, meaning it is related to otters, skunks, and other small predators that are typically solitary and hunt year-round. The family Mustelidae sits inside the order Carnivora, telling us that honey badger is a carnivore, and likely hunts or scavenges for its meals. The order Carnivora sits inside the class Mammalia, telling us that the honey badger is a mammal, gives birth to live young, and feeds them with milk produced in mammary glands. Lastly, the class Mammalia sits inside the phylum Chordata and the Kingdom Animalia, telling us that the honey badger has a vertebrae, bilaterally divided body plan, and is only heterotrophic. The second name, capensis, tells us that honey badger is different from any other species in the genus Mellivora. However, the honey badger exists as the sole member of its genera, which sometimes happen. Other genera, especially of fish and invertebrates may contain hundreds of species. While it may seem that every genus should contain the same number of species, this is misleading, as the organization of species should reflect evolution. Evolutionarily, the number of organisms included in a genus should reflect the diversity of that group. If many species are being created as the genus radiates through an area, the genus will have many species. If only one species has managed to survive in a genus, the genus should contain only one species. The organization of organisms into various taxonomic groups is a continually evolving process, and new genera are described every day. Some of these are newly found organisms, which have never had a name. Others become reclassified based on new information, such as DNA analysis. By analyzing DNA, comparing the traits of various animals, and proposing different phylogenies, scientist can hypothesize at the most likely progression of evolution. This informs the naming of various animals, and decides which groups of species can become a distinct genus. Species – A group within a genus that is reproductively isolated and unique from other groups. Family – The taxon above genus in the hierarchical classification of organisms. Taxon – A group of animals with similar characteristics. 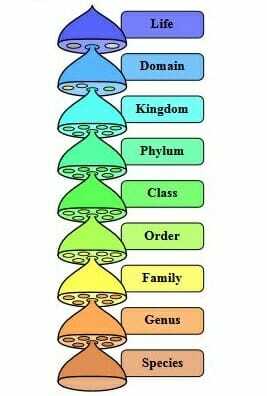 Binomial Nomenclature – The system of naming organisms using generic and specific epithets. 1. Two fish swim next to each other in the ocean. They are similar, though they don’t reproduce. They are unlike any of the other fish in the ocean. Which of the following taxon could these fish represent? A is correct. Because these fish are so similar but do not reproduce, they likely constitute a genus. If they could reproduce together, they could be considered a species. It is very unlikely that the fish represent a different phylum, because they are not that different from other fish. For example, the phylum Chordata includes all the organisms in the world with spinal cords. That’s a pretty big group! 2. Polar bears, Ursus maritimus, can reproduce successfully with brown bears, Ursus arctos. Although they are in the same genus, they are considered different species despite their ability to reproduce. Why is that? A. They can reproduce, but their babies are not viable. B. Because they occupy different ecological niches, they rarely get opportunities to reproduce. C. They should be considered the same species as well. B is correct. Although the bears are extremely close to being the same species, they are different enough to be considered separate. The polar bear spends the majority of its time on the ice, hunting seals and other sea mammals. The brown bear is excluded to lower latitudes, where it hunts different large mammals and scavenges. Thus, the bears rarely come into contact, and are excluded from reproducing by an ecological barrier. Their babies, however, would be completely viable if they were to reproduce. In fact, many scientists hypothesize that as climate change depletes the ice caps, polar bears may be pushed back into the niche occupied by brown bears. If their niches once again overlapped, the bears could merge into a single species. 3. Scientists recognize a certain genus of bacteria, Fakus, by the thick extracellular matrix they produce. A new species of Fakus bacteria evolves, but without the thick matrix that classifies the genus. Should the new bacteria be added to the genus? Why? A. Yes. It is related through common decent. B. No, as the genus is identified by a thick extracellular matrix. C. No, because the bacteria is too different from the rest. A is correct. While this example is straight-forward, this is often a problem for taxonomist. Oftentimes, we cannot see which organisms evolved from which, as in the question. Without this knowledge, it would be very difficult to include the new species into the genus. But, we know that the species is still closely related to the other species, and that the lack of an extracellular matrix is just a derived trait. You can see how the classification of organisms can begin to be a tricky business when the relationships between organisms are unknown. In those cases we must rely on anatomy, behavior, and the evidence we can glean from DNA testing. Who Came Up With Binomial Nomenclature?